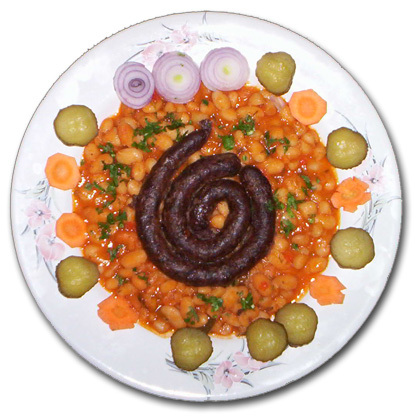 Fasole cu cârnaţi (Romanian for "beans with sausages") is a very popular Romanian dish, consisting of baked beans and sausages. A variation replaces the sausages with afumătură (smoked meat). Left: Fasole cu carnati, a traditional Romanian dish. Also a traditional Army dish, fasole cu cârnaţi is prepared by Army cooks and served freely to the crowds during the National Day celebrations (on the 1st of December) in Bucharest and Alba Iulia.